Graduate school debt: Is it a crisis? Grad students are the new face of student debt. But is it a crisis? Congrats, grad. Here’s your diploma and here’s a mound of debt. Photo illustration by Slate. Photo by Burlingham/Thinkstock. It’s been clear for a long time that graduate school tuition can be soul-crushingly expensive. But up until recently, it’s been more or less impossible to figure out just how much MBAs, J.D.s, M.D.s, and the like were contributing to the growth of America’s $1.2 trillion student debt load. Now we’re starting to figure it out, and the early evidence suggests that they’ve been a giant, underappreciated piece of the puzzle. Moreover, as a new report from the New America Foundation argues, the federal government itself may be fueling some of their worst borrowing excesses. So, are graduate students the new face of the student debt crisis, as certain news sites have suggested? Let’s start with the basics. Grad students make up about 15 percent of higher ed. But during the most recent full academic year, they received one-third of all federal direct loans. For all the attention the media lavishes on the cost of an undergraduate education, it turns out that a disproportionate piece of the country’s loan tab is being racked up in the pursuit of advanced degrees. Unfortunately, we don’t know exactly how much that slice of the pie has grown over time, because the Department of Education didn’t track it until last year. Bummer, I know. Thankfully, we do have a sense of how individual debt burdens have jumped. Using Department of Education data, New America found that in 2012, 58.6 percent of students finishing a master’s or professional degree borrowed for graduate school. Among that group, the median grad borrowed $41,000, up 21 percent since 2004. By comparison, the median undergraduate borrower finished $27,000 in debt in 2012, up 39 percent over that eight-year stretch. Part of what makes these numbers so disconcerting is that graduate school attendance has surged in the past decade. Colleges and universities awarded 57 percent more master’s degrees in 2010–2011 than they did in 1999­–2000, for instance. So you have more students taking out more debt. And then there’s the most worrisome contingent: the extreme borrowers. Take medical students. At the 75th percentile, M.D.s now finish $200,000 in hock. Among law students, the figure is $173,000. The numbers are especially vertiginous when you combine undergraduate and graduate loans, as in New America’s graph below. Among all graduate degree holders, the top quarter of borrowers are finishing their educations about six figures in debt. This is where Uncle Sam’s lending policies come into play. The problem has two parts. First, students are allowed to borrow unlimited amounts under the Grad Plus lending program. To put it another way: A law student at a third-tier institution with spotty employment stats could, if he so chose, finance every single dollar of his legal education with debt. Ordinarily, the threat of crushing monthly loan payments might dissuade him from doing so. But that brings us to Part 2 of the problem: Beginning with the Bush administration, the federal government began offering income-based repayment programs, which today forgive loan balances after 20 years, or 10 years for public service workers. Unless you’re on the public service plan, whatever gets forgiven is also taxed—which, with a big enough balance, could be painful. Still, some of the most indebted students may be running up gaudy loan balances in part because they know that the government will eventually write off the vast majority of their debt. The New America report’s author, Jason Delisle, told me he didn’t think the government’s loose lending was necessarily driving up the median level of debt—but it might be fueling extreme borrowing. “I think those numbers are juiced by Grad Plus,” he said. All of which brings us back to the big question: Are we facing a “crisis” or not? That depends on how you define it. If you think all student debt is bad student debt, then this all probably looks like loan-ageddon to you. But that would be an oversimplification. In the end, most of these students, including those young doctors with $200,000 in loan bills, will probably earn a decent return on their education. 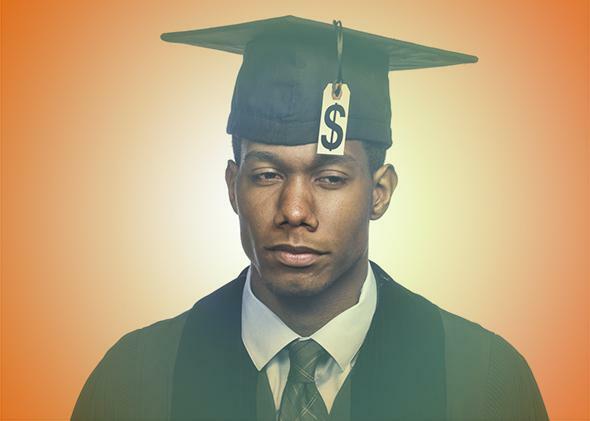 Grad school isn’t the golden ticket it once was, but it can still be very lucrative. Meanwhile, grad students who run into financial trouble appear to be pretty good at enrolling in those income-based programs, which cap loan payments as a percentage of their monthly earnings and offer loan forgiveness down the line. Chances are, we’re not about to witness millions of graduate students defaulting on their debt, like so many hapless subprime mortgage borrowers. Those forgiven loans probably aren’t going to blow much of a hole in the federal budget, either. Still, Washington is clearly fueling a problem. Even if graduates don’t default on their debts, shouldering more than $100,000 in loans will certainly make life less pleasant for plenty of them. Some who borrow far less still won’t earn enough to make the time they spent in school worthwhile. And by pairing unlimited federal lending with almost unlimited loan forgiveness, Washington has largely killed whatever incentive graduate school programs once had to keep their prices down—one or the other needs to go. We’re feeding the graduate school beast. We don’t need to wait around for a real financial disaster before we stop.